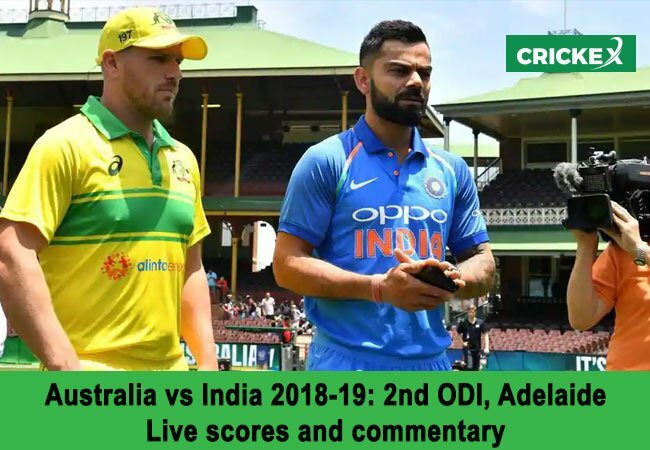 India vs Australia, 2nd ODI: Live scores: Virat Kohli’s India take on Australia in a do-or-die second ODI on Tuesday. Rohit Sharma’s 22nd hundred in 50-over format. Dhoni’s 51 off 96 balls and failing to rotate the strike has brought to focus the rejigging that skipper Virat Kohli and coach Ravi Shastri will have to fret upon. With Dhoni being slotted at No 5 even though vice-captain Rohit wants the veteran to bat a notch higher but cues from India’s training session made it clear that the team is unlikely to tinker with the batting order. After losing the Test series, hosts bounced back in style as they defeated dominant India in the opening match of the three-ODI series on Saturday to take a 1-0 lead. Keeping in mind that the World Cup is around the corner, Kohli will want to win the ODI series as well Down Under to make a statement that they are one of the favourites to lift the trophy along with England, the hosts of the multi-nation tournament. India make one change for thre 2nd ODI: Mohammed Siraj makes his ODI debut as he comes in for Khaleel Ahmed.India XI: Shikhar Dhawan, Rohit Sharma, Virat Kohli (c), Ambati Rayudu, Dinesh Karthik, MS Dhoni (wk), Ravindra Jadeja, Kuldeep Yadav, Bhuvneshwar Kumar, Mohammed Shami, Mohammed Siraj. Aussie skipper Aaron Finch wins the toss, opts to bat in the 2nd ODI at the Adelaide Oval.”We are gonna bat first mate. Looks like a good wicket to bat, don’t think it’ll change much throughout. We played a really good game the other day. I think it’s a good chance to put some pressure on with a good score. It’s always good to play against a world class outfit and improve as a team leading into the next phase of the year,” Finch said. Meanwhile, even Virat Kohli wanted to bat first had he won the toss. “We would have batted first as well, looks a great wicket to play on. The conditions are going to be a big factor for us as it’s hot and humid. We were a bit scratchy at Sydney, just to get the one side together. We can’t take Australia lightly in Australia. We like to be in these situations where we get to bounce back as a team. Mohammad Siraj makes his debut today, Khaleel Ahmed makes way for him,” the Indian skipper said. Aussie openers Aaron Finch and Alex Carey are at the crease and fast bowler Bhuvneshwar Kumar to open the bowling for India. Decent beginning for India as Bhuvi gives away just three runs in the first over. Mohammed Shami with the ball from the other end.